Headaches may be one of the most common types of body pain. However, frequent headaches may indicate a more serious condition. A headache is the pain from the body’s upper neck or the head. It occurs due to the structures and tissues that surround our brain. You may feel a dull ache, throbbing, mild, sharp or intense pain when you have headaches. However, most headaches have varying pain levels because they have different types. Tension headaches. Tension headaches are the most common type of headache that most people experience. Pain is usually located at your temples or at the back of your neck and head. Women are more susceptible to this kind of headache than men. Migraine headaches. This is the second most common type of headache that affects children and adults, especially during puberty. However, more women experience migraines after puberty. Cluster headaches. A cluster headache affects more men than women. This type of headache is often recurring. Pain is normally felt on one side of the head and is accompanied with nasal congestion and watery eyes. Sinus headaches. 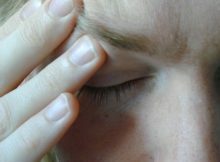 This type of headache occurs when the sinus is inflamed. It is often due to infection. Most sinus headaches often come with a fever. Rebound headaches. The overuse or overdose of headache painkillers lead to a rebound headache. Tylenol, aspirin and ibuprofen medications are the primary culprits for this kind of headache. You need to determine which type of headache you are experiencing in order to receive the proper treatment and medication for it. Over-the-counter medications such as ibuprofen, aspirin and Tylenol are often used to relieve you from most headaches. Antibiotics as well as decongestants are used to treat sinus headaches. Finally, taking the right amount of pain medication can relieve you from experiencing rebound headaches. Having considerable nutritional value, apple cider vinegar helps reduce headaches. Apple cider vinegar also offers health benefits like aiding detoxification, controlling blood sugar, regulating high blood pressure, reducing bone pain, promoting weight loss and relieving constipation. There are two methods for using apple cider vinegar. Both methods should ease your headache considerably in a very short time. The first one is for more permanent results in the fight against headaches and numerous other health issues. This one is a daily routine, and you should be drinking this mixture in the morning, in the evening and, if you feel it necessary, at mid day. Method 1: Add 2 tablespoon of organic apple cider vinegar in an 8 ounce glass of cold water and add 1 tablespoon of honey. Drink this solution two or three times a day. If 2 tablespoons is too much try it with 1 tablespoon. Method 2: Bring equal amounts of water and organic apple cider vinegar to a boil. Remove from the heat, place a towel over your head and inhale the vapors that rise from the bowl for about 10 minutes. People that experience frequent headaches and use apple cider vinegar for treating them say that this method never failed!